Turkish rabbi; born in 1813; died at Jerusalem Feb. 4, 1874. He was the sixth rabbi of Adrianople descended from the Gueron family. He became rabbi in 1835, and eleven years later met Sultan 'Abd al-Majid, whom he induced to restore the privileges formerly conceded to the non-Mussulman communities. 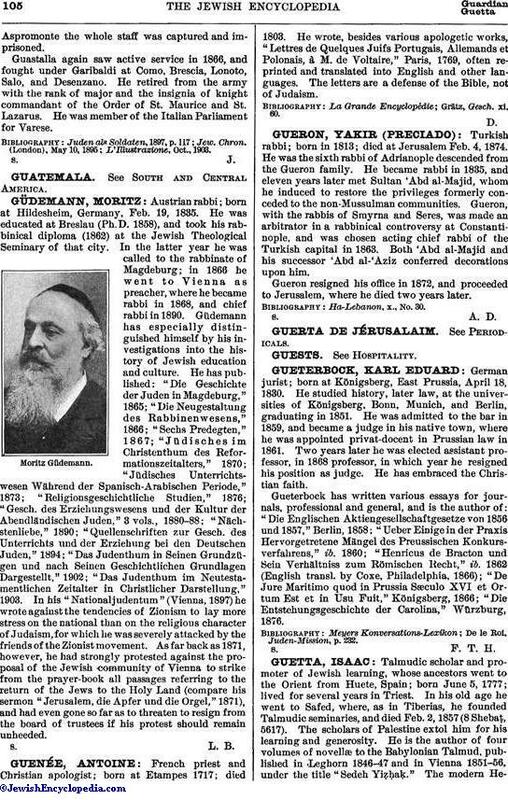 Gueron, with the rabbis of Smyrna and Seres, was made an arbitrator in a rabbinical controversy at Constantinople, and was chosen acting chief rabbi of the Turkish capital in 1863. Both 'Abd al-Majid and his successor 'Abd al-'Aziz conferred decorations upon him. Gueron resigned his office in 1872, and proceeded to Jerusalem, where he died two years later.